This wonderfully aromatic, organic loose leaf tea combines Pu-erh, a traditional Chinese dark tea, with an American favorite - chocolate and almonds. While Pu-erh teas have grown in popularity in the US because of their smooth rich taste and health benefits, some consumers still do not prefer their unique earthy aroma. Our Organic Chocolate Pu-erh Tea offers the perfect solution! With a rich bouquet of almond and chocolate, this tea brews up dark brown with a medium body that has no astringency or bitterness. The mellow cup tastes earthy with hints of carob and almond. Add a little sugar, to enhance the chocolate flavor! 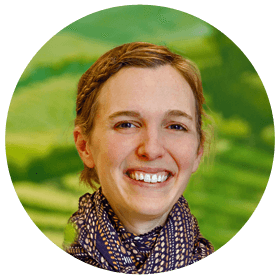 Read our blog post about our trip to Pu Erh, China! "Think dark chocolate rather than milk chocolate, with no bitterness. 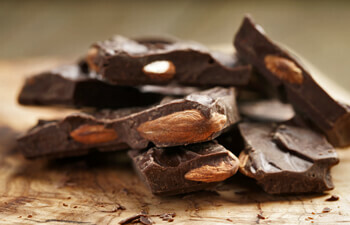 Add sugar to recreate a dark chocolate Almond Joy or marzipan-like delight!" 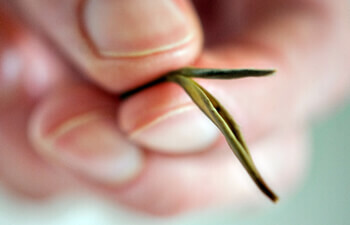 "As a Pu-erh tea “purest”, I was hesitant to develop this tea. But I have to admit, that I am pleasantly pleased by the result. 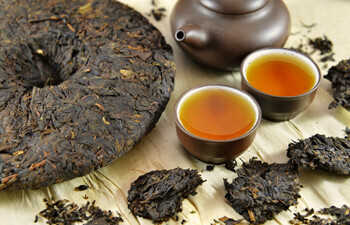 Even Pu-erh lovers will enjoy the combination of chocolate, almond, and Pu-erh." "I recommend brewing this tea for at least 5 minutes. The darker it gets, the more full-bodied and better it gets!"